A concert announced just 24 hours before its start date could never work, right? Levels and Krewella proved that notion completely wrong on Saturday night. 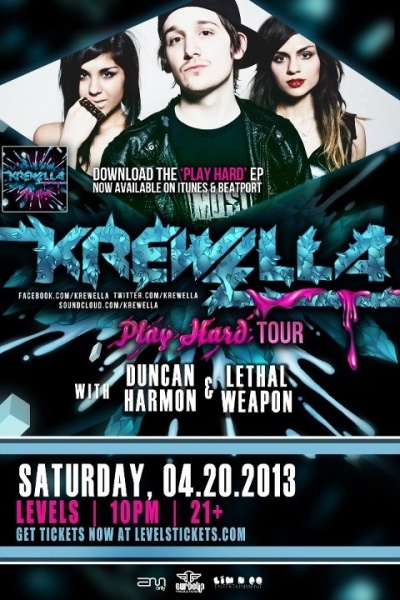 The show, a part of Krewella’s Play Hard Tour, was announced on Friday, and was only open to patrons that were 21+. The show completely sold out before the Krew even took the stage. Duncan Harmon, a local DJ at Penn State, got the crowd going early, and did not disappoint at all. He flawlessly mixed songs together from all genres, as did Lethal Weapon, the act that immediately followed Duncan. A remix of “Sail”, by AWOLNATION, instantly got the crowd interested, and Lethal Weapon continued to hold the crowds’ attention until Krewella came on. Jahan and Yasmine Yousaf took the stage without their partner in crime Rain Man, who was unable to make it to the show. However, the two beautiful ladies completely held their own without him, and showed that they are expert mixers, along with being superb vocalists. They ran through hits from their debut EP Play Hard, their remix EP Play Harder, and remixes of Knife Party, Adventure Club, and Skrillex. Other hits that kept the crowd going crazy were The Partysquad and Boaz’s “Oh My”, Crizzly’s remix of “Chain Hang Low”, GTA and DJ Funk’s “Booty Bounce”, Kid Kamillion’s trap remix of “Heads Will Roll”, Milo and Otis’s remix of “Wonderwall”, a huge bootleg of Knife Party’s “Internet Friends”, and of course, a fan favorite, Skrillex’s remix of “Cinema”. Fans also got exclusive sneak peeks to brand new material from Krewella that definitely will not disappoint upon its release, including collaborations with Nicky Romero and Gareth Emery. Both the new and old material perfectly mixed their beautiful vocals with filthy drops that kept the heads banging. Krewella finished their set with their massive top 40 hit “Alive”, which had the entire crowd reaching for the sky and singing vocals straight back to the lovely ladies. The original mix of “Alive” flowed perfectly into the Pegboard Nerds Remix, which was the perfect way to end the show, with a [head]bang. Luckily, after leaving the stage for a few seconds, Krewella came back out for a 10 minute encore set that almost brought Levels down upon itself. Krewella tore through massive dubstep hit after hit, and massive mosh pits ripped open in the middle of the floor. Their encore ended with champagne spraying everywhere as their latest single, “Come & Get It” and its remixes blasted through the speakers and shook the floor. One of Krewella’s favorite mottos and sayings is “Get wet”, and they made certain that no one left the venue dry; every person that exited was drenched with a combination of sweat, water, beer, and champagne, but it was completely worth it. Levels deserves a HUGE shout out for being able to put this unbelievable concert together in such a short time, and Krewella deserves all the praise in the world for being nothing short of incredible. Although people 21 and older were able to see Krewella after their opening gig for Pretty Lights got canceled earlier this year, students who aren’t 21 would love and deserve to see Krewella, so hopefully the wonderful trio make another triumphant return to State College and Penn State somewhere in the near future.